What to do with mom when she comes to Paris to visit you for a day? Go to Versailles of course! Secretly, I think both of us were hesitant about the idea. Me: The crowds! My mom: All that walking! The palace of Versailles is the No. 1 tourist attraction in the Paris area, with over 3 million visitors a year and counting! How to beat the crowds? The Versailles website suggests getting there at the opening, at 9 a.m. So that's what we tried to do—but failed. I was to meet mom at her hotel, and go directly to the palace. But mom had a heavy bag of presents to give us, so that meant going home first. 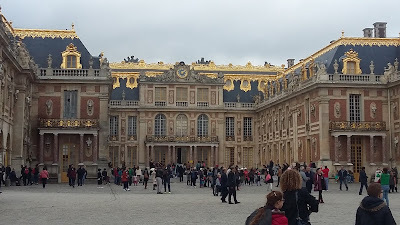 By the time we got to Versailles, it was 11 a.m.
To buy our tickets, we headed into the very helpful Versailles Tourist Office, about two blocks in front of the palace. Unless we wanted to wait in line for an hour, the clerk strongly advised us to delay our visit until 3 p.m.! What to do? Visit the gardens! They are free of charge, and vast, stretching on for about 2,000 acres. I was tempted to rent a golf cart to get us around, but my teenage daughter was completely against such an embarrassing idea! I wonder what the French kings did to get around? Probably something like a golf cart, but pulled by horses. The gardens are not just one garden, but is a group of individually designed and decorated areas. My favorite was “The King's Garden,” designed as an "English garden,” which is wilder and more natural than a manicured “French garden.” The French gardens at Versailles typically feature statues, and a pool or fountains—a high-tech flourish in the 17th century. 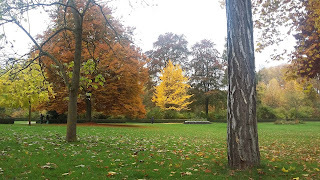 My daughter and I wanted to see the gardens again after watching the excellent movie about their creation, “A Little Chaos” (2014). The walking worked up our appetites. We saw a sign near the Apollo Fountains for a restaurant called La Petite Venise. That might just work, I thought, as it was off the beaten tourist trail. 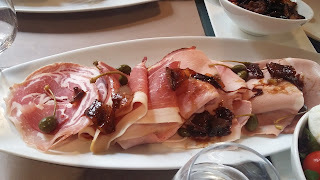 The white tablecloths gave us a fright, but we found a copious antipasti dish--Italian cold cuts, cheese, and vegetables--to share among the three of us at 31 euros. Perfect! Fortified, we went to check out the lines for admission to the inside of the palace. To our surprise, the lines had completely disappeared. Or so it would seem. Once inside, tour groups flagging their selfie sticks choked the rooms. No fun at all! So after we saw the main sights--the queen and king's bedrooms, the chapel, and the Hall of Mirrors--we made a run for the exit. 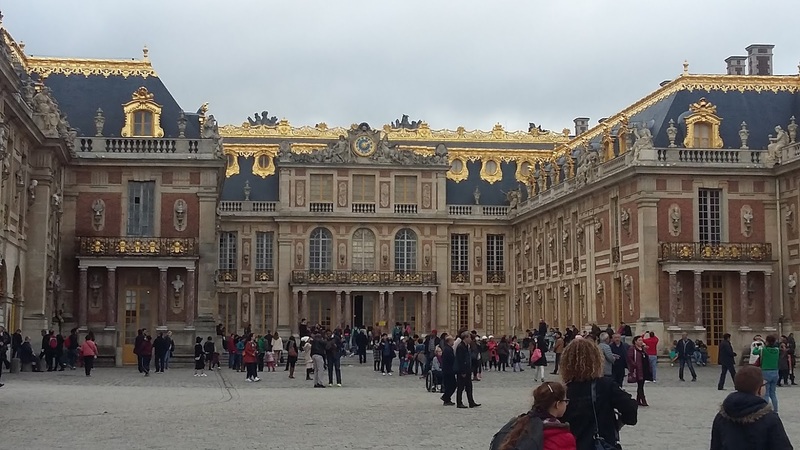 Want to really enjoy Versailles? See it from the outside. When the French kings tired of being suffocated by life inside the palace, they found refuge in the gardens. Today's tourists can do the same. Use your admission fee to instead eat like royalty at one of the garden's restaurants. And don't be shy about renting a carriage, I mean a golf cart!